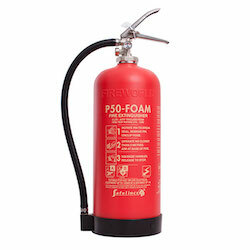 For companies wishing to avoid the cost and interruption from extinguisher maintenance, service-free extinguishers, such as the UK manufactured P50, are a feasible solution, although the initial purchase price is usually higher than for traditional steel extinguishers. Service-free extinguishers must feature two pressure gauges, hold the chemicals in a container that does not react with them, must not have detachable lining and have to be of a particularly robust design to allow the servicing recommendations of BS5306 to be avoided. While obviously no maintenance visits by service engineers are required, the owners must, by law, have a routine to maintain the extinguishers in an operable state. This means that annually, a visual inspection of the body for any damage must be carried out by the owner or their representatives, the gauges and the hose must also be checked visually. The result of the inspection must be recorded on the extinguisher and in the company’s fire safety log book. In addition, like all extinguishers, there should be a regular visual walk-past to ensure the extinguisher is present and pressurised. The P50 service-free extinguishers have an additional advantage in that they only need to be refilled after ten years rather than the five years recommended for traditional steel extinguishers, a big cost and environmental saving. It is important that the service-free extinguishers are certified by a reputable body, such as the kitemark from BSI. While service-free extinguishers can, in theory, be installed by anybody, it is highly advisable to have a site survey carried out before deciding on the extinguisher cover. Usually, the suppliers of service-free extinguishers will include site survey, install, commissioning and training in their price. The training of staff in the visual inspection is important and is usually certified by the provider and evidences the competency of the staff carrying out the visual inspection. 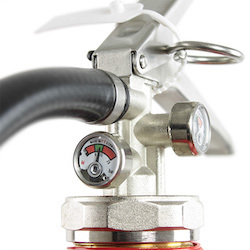 Where service-free extinguishers are installed in private homes, no visual inspection is required by law, however, we would still recommend a quick visual check that the pressure gauges are showing green. Risk of bursting if cylinder has been corroded through The body of the P50 extinguisher is cocooned in aramid fibre with a safety release area designed into it. If for whatever reason the pressure would rise massively beyond the safety margins, the cylinder discharges safely through this release area. Risk of bursting if dented In 2013 a van reversed over a P50 extinguisher and, of course, caused significant damage to some parts of the extinguisher. However, the pressure in the extinguisher held and the extinguisher would still have worked! The design of the fibre cocoon is extremely robust. Gauge malfunction and hidden loss of pressure The P50s are equipped with two gauges. It is statistically almost impossible for two gauges to have the same display error, so by visually checking two gauges, the risk of the extinguisher having suffered a loss of pressure undetected is almost zero. In addition the gauges are magnetic and each P50 is supplied with a test magnet fitted to the base which allows verification that the gauges work correctly. Chemical change of fire fighting chemicals when in contact with steel makes the chemical lose their fire fighting capabilities Since the chemicals are only in contact with inert plastic, no chemical changes occur. Blocked hose As part of the annual visual inspection the customer checks the hose by looking into the end of the hose to see if anything has been pushed into the hose. As the hose is connected with a crimp connection there is no risk that the valve-side of the hose has been tampered with. Clumping of extinguisher powder The extinguisher is clumping-free powder and with the extinguisher being pressurised by nitrogen, there is no moisture that could lead to clumping. Also, the extinguishers are not re-filled after 5 years, an action which leads by its very nature to moisture ingress. Important note: We have heard stories where service engineers visited a customer and insisted on ‘servicing’ the service free extinguisher or even refilling them. This actually invalidates the warranty of service-free extinguishers. UK Fire Service Resources recommends Safelincs Safety Products for all Fire Extinguishers and Servicing.